Most camps at Mara Naboisho in the Masai Mara ecosystem will offer the option of one full-day game drive, or two shorter game drives during the day. You will either depart from the camp early with a packed breakfast and return for lunch and an afternoon game drive, or enjoy a slightly more leisurely start to the day with breakfast at the camp and a packed lunch to enjoy your game drive out on the plains. 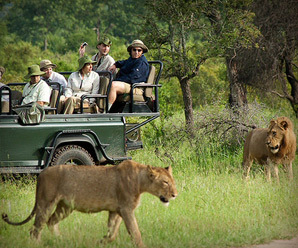 Game drives are the key focus of most safaris, but it is the guides who really make the difference. Each of the guides working in the Mara Naboisho Conservancy has been trained with an understanding of responsible tourism and the part they play in the maintenance and conservation of the ecosystem. The majority of the guides were trained at the Koiyaki Guiding School – an initiative funded by the partners of the conservancy to ensure a culture of sustainability for the local communities. In addition to their individual training, there is a strict code of conduct that has to be adhered to at all times, making the guides accountable for their actions. These rules have been put in place to protect the wildlife, protect the environment, and ensure that visitors to the conservancy enjoy the most rewarding game experience possible. The guidelines include a limit on the number of cars that are allowed to be present at a sighting, and a minimum distance (20 meters) that guests must maintain from the animals. These rules protect the wildlife and prevent them from being harassed, which means that they will be more relaxed around vehicles as they will not feel threatened (as they are sometimes in the Masai Mara National Reserve). In order to ensure that these rules are followed, only guides from within the conservancy are allowed to conduct game drives. This also ensures that vehicle numbers are kept to a minimum inside the conservancy.